He simply said, “would you like to build a car for one third less than a Mazda 323?” All three heads nodded in the affirmative. He then asked, “would you like to sell that car for one third more than a Mazda 323?” all three heads nodded enthusiastically. 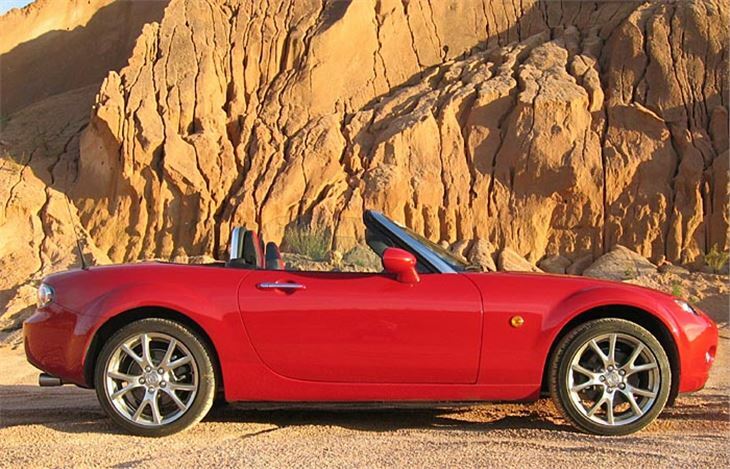 That’s how the original Mazda MX5 got signed off. 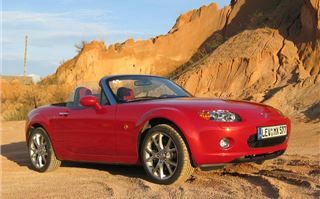 Now, 16 years and 721,000 sales later, we have a third incarnation of the most successful sportscar ever built. Some important differences are a slightly longer wheelbase, theoretically allowing drivers up to 6’ 1” tall to fit comfortably inside the car. 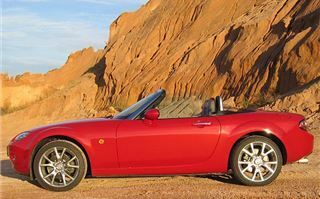 The soft-top latch is now central, enabling the hood to be folded up or down single-handedly in as little as 3 seconds. The new chain-cam engines are more powerful, yet the 1.8 offers better fuel economy and lower emissions, making it a better BIK deal for company drivers. And, despite being bigger and better, the car is only 10kg heavier than before. Some of the weight saving has been in the suspension which now has aluminium rather than pressed steel wishbones and ultra lightweight anti-roll bars, and the fuel injection system is a light plastic moulding rather than a heavy metal casting. 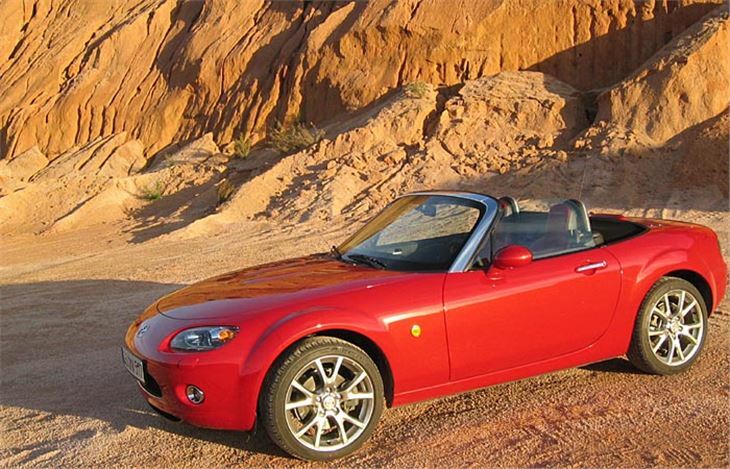 The new car had a long gestation and project leader Nobuhiro Yamamoto was keen to emphasise the singleminded concentration on ‘Jinba Ittai’, the ancient Japanese martial art of horseback archery that required man and his mount to work together in perfect harmony (the very qualities that made the MX5 Mk 1 and 11 so well loved). 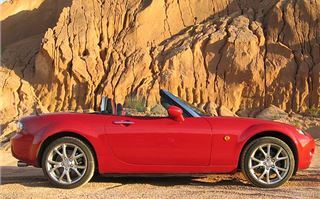 320 sketches from Mazda design studios in California, Germany and Japan were refined into seven quarter scale models, then three full-scale models that had to pass the test of being recognisably MX5s from 100 metres. 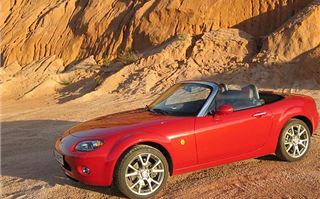 The Japanese design won, but details from both the Californian and German cars were incorporated into the final production car. We did this test the wrong way round, starting with the £19,995 2.0i Special Launch Edition (now sadly sold out), and finishing with the £16,400 1.8i with cloth top and alloys. First impressions are there’s lots to like. Details such as the switches and door handles and the feel of the steering wheel are all really nice. There are four cupholders (for two passengers?) in the doors and centre console, but of course the centre console doubles as a space to keep mobile phones, digital cameras and other bits and pieces. The top really does go up or down in 3 seconds, and stores neatly, level with the waist of the car. 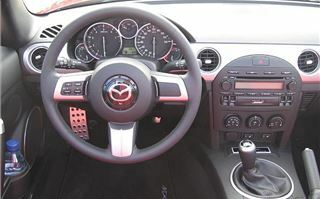 The steering wheel is height-adjustable and the seat is rake-adjustable, but drivers with longer legs will find themselves sitting upright because with the seat right back the built-in roll hoops stop it being reclined at all. It was ideal for me at 5’ 9”, and everything was in the right place. But I’d urge anyone taller to go for an extended test drive before swallowing the notion that a six-footer can be really comfortable. 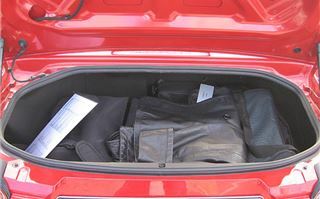 Apart from the console cupholder storage, a decent sized glove locker and a lockable compartment behind the seats, there isn’t any storage space inside the car (zoom zoom without much room room). 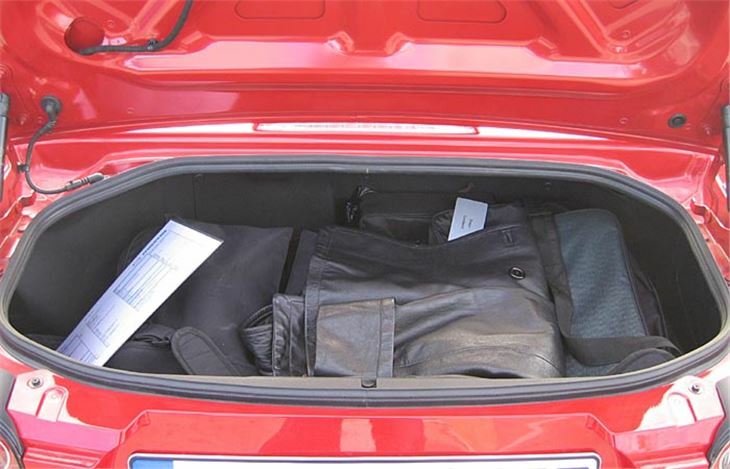 And though the boot takes 150 litres, and will take golf clubs laid across, 150 litres isn’t very much. So Mazda offers an accessory bootrack and airline cabin compatible aluminium suitcase, which are worth investing in if you were planning a touring holiday in the car. Out on the road, it accelerates well and handles beautifully but on our 2.0i 6-speed there was a bit of a power spike between 2,500 and 3,000rpm that needed to be ‘driven around’. No problem once you got used to it, but a good reason to leave the standard DSC working on wet winter roads. The mesh windbreak works well and you don’t get uncomfortably buffeted even at up to 120mph. 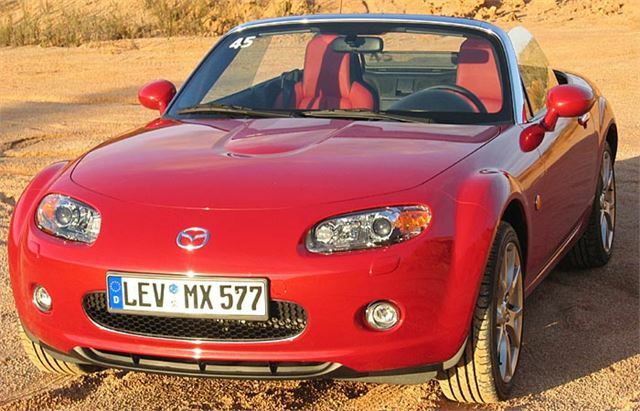 To give us a chance to fling the car around in relative safety, Mazda booked a go-kart track for the morning. That’s right. An impossibly tight, twisting, narrow go-kart track. It was second gear all the way, maximum speed no more than about 50mph and a lot of it no more than 30, yet the objective of proving how chuckable the car can be was achieved. 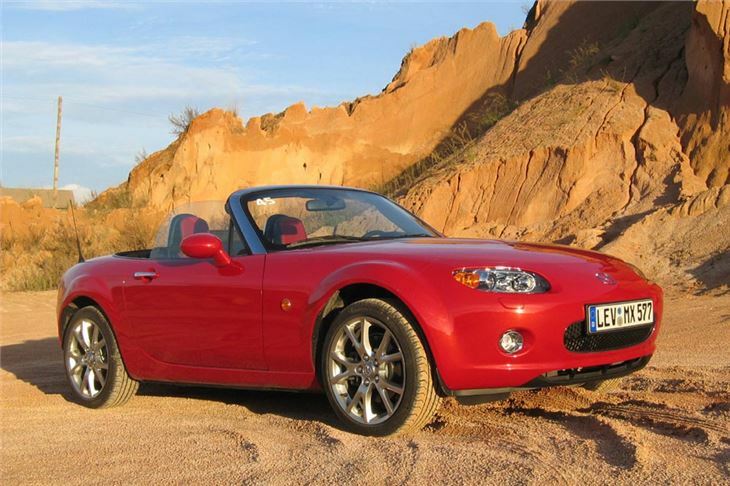 It was a severe test of the otherwise very progressive brakes, though, which faded badly given the go-kart treatment. Not that this is likely on the open road. Then, we got to drive the theoretically much slower 126PS 1.8i 5-speed, and I’m pleased to tell you that the cheaper car is a peach. With a sweetly progressive power delivery and no DSC, it really can be driven hard yet kept on the right side of the road, bringing smiles and no nasty surprises at all. On its squidgy Yokohama tyres it was totally predictable, every wheel sending a separate message of exactly how much traction it was getting and giving a useful margin for error. ‘Jimba Ittai’ personified. Absolutely huge fun. Better even than a MINI Cooper. And with excellent ride quality that soaked up all kinds of dodgy road surfaces.